^ Mark, Galeotti. Russia's War in Chechnya 1994-2009. 鱼鹰出版社. 2014. ISBN 1782002774. ^ 4.0 4.1 4.2 4.3 滴血的领土 花絮 网友“永不言败库尔兰”评车臣战争. ^ 5.0 5.1 Mark, Galeotti. Russia's War in Chechnya 1994-2009. 鱼鹰出版社. 2014: 23. ISBN 1782002774. ^ Gall, Carlotta; Thomas de Waal. Chechnya: Calamity in the Caucasus. New York University Press. 1998: 177–181. ISBN 0-8147-2963-0. ^ Gall, Carlotta; Thomas de Waal. Chechnya: Calamity in the Caucasus. New York University Press. 1998: 174. ISBN 0-8147-2963-0. ^ Cluster Munitions Use by Russian Federation Forces in Chechnya. Mennonite Central Committee. 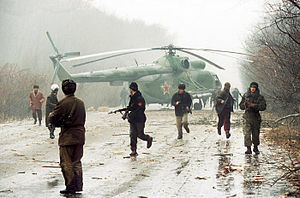 ^ Wounded Bear: The Ongoing Russian Military Operation in Chechnya 互联网档案馆的存檔，存档日期2010-01-02. ^ The Chechens and Urban Operations 互联网档案馆的存檔，存档日期2007-09-27.